Celebrate one of the best food holidays with a delicious and simple Mixed Berry Cream Cheese Danish. You’re definitely not going to regret it. I have an important announcement my friends. Friday is National Donut Day and I’m here for it. Any reason to celebrate something ridiculous with something delicious is worthy in my book. National grilled cheese day, chocolate chip cookie day and margarita day are also high on the priority list. You only live once. 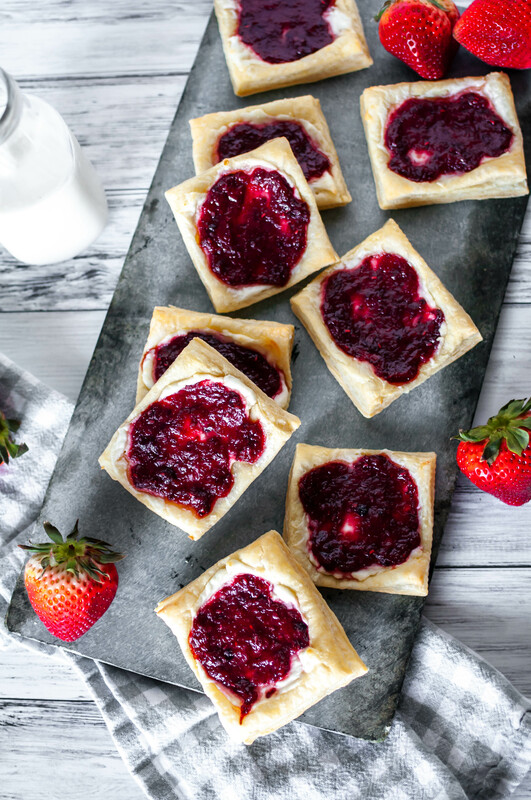 These Mixed Berry Cream Cheese Danish start off with store-bought puff pastry dough which makes for a huge time saver. And the texture you guys?! It’s so light and flaky and crisp on the edges. You could also use crescent dough if you can’t find the puff pastry but it should be in the freezer section of any grocery store. Slightly sweetened whipped cream cheese is the next layer. I really love to use the whipped variety as it adds a light, airy texture which pairs really nicely with the flaky dough. I topped the slightly sweetened cream cheese with my homemade mixed berry jam I shared a few weeks ago. It’s super simple to make in the Instant Pot or on the stove top if you don’t own a pressure cooker (instructions are included for both methods). The jam uses a small amount of sugar so it really highlights the flavors of the berries you use and keeps it on the healthier side. If you’re not feeling homemade jam, you can definitely use store-bought. I would recommend a jam or preserve for that chunkier, more interesting texture. Once all the layers are assembled they bake up quickly and you’ll be ready to celebrate National Donut Day. Or Friday. Because do we really need a reason for donuts? Unfold puff pastry then cut into thirds lengthwise. Turn and cut into thirds in the other direction to make 9 squares. Prick the middles with a fork leaving a half inch border around the edges. This keeps the middle from puffing up. Place them on the prepared baking sheet. Mix sugar and cream cheese together gently. Spread 1 tablespoon onto each puff pastry square. Top the cream cheese with a half tablespoon of jam each. Bake for 12-14 minutes, until puffed and golden.